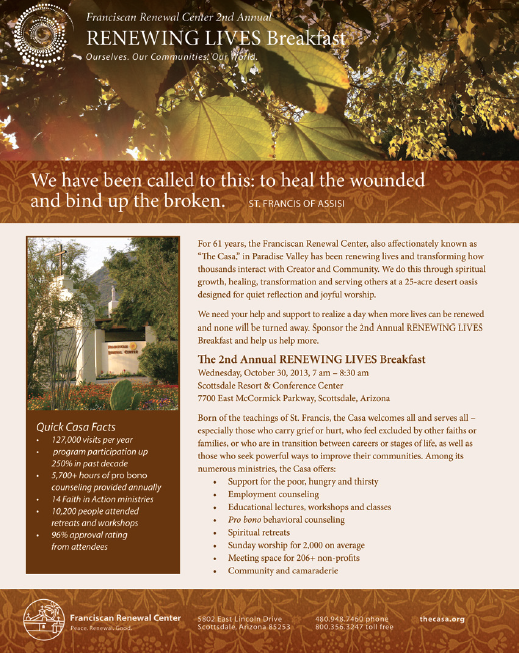 Born from the teachings of St. Francis of Assisi and founded in 1951 as a retreat center for those seeking sanctuary in nature, the Franciscan Renewal Center was running out of room. It had aging facilities for worship, meetings, counseling and retreats. Coupled with a non-judgemental philosophy that “all are welcome,” the overcrowded conditions threatened its hallmark serenity on 25 under-utilized acres. The friars concluded they would not turn anyone away; they must make room for more by transforming their land. A comprehensive fundraising campaign — “Renewing Lives” — was launched to accomplish new construction ($20M), increase operational sustainability ($2.5M annually), and expand commitments to the endowment ($25M). Central to the campaign was completion of a new church. Using the Benevon model, the organization defined a vision and inspired its donor culture, while holding true to a faith-centered mission of respect for creation. The case for support and fundraising activities were carefully constructed to resonate via spectacular photography of the grounds (aligning with St. Francis’ love of creation), Biblical references, and the writings of St. Francis himself to demonstrate that community values were understood and honored. Tactics included introductory events, “friar-side” chats, community town halls, municipal presentations, media relations, video testimonials, direct mail, email marketing, interactive touchscreen kiosk, and an annual ask event — in tandem with an overhaul of existing public-facing materials (weekly and bi-annual publications, and website). The campaign exceeded its capital goal, raised more than $4.4M in unrestricted funds, attracted 220+ households to pledge multi-year gifts plus 34 families to the planned giving program. A new church designed by Westlake Reed & Leskosky opened in October 2017 — proving that despite a national decline in religious identification, inspired support for the Franciscan Renewal Center was stronger than ever.